We can’t think of a better way to toast spring. Used in the past as a method of preserving fruit, a shrub is just a fruit syrup made with vinegar instead of water. 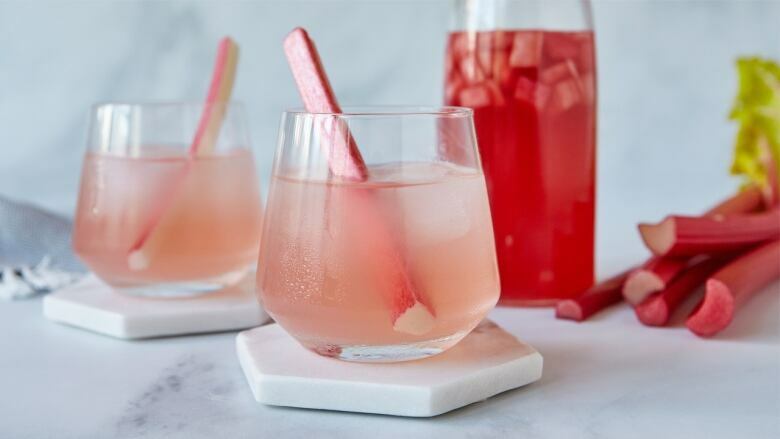 This tangy rhubarb shrub can be added to mineral water, sodas or cocktails for a refreshing tart drink. For a refreshing soda, add 1 oz shrub to tall glass. Fill with ice and top with sparkling soda water. Spike with vodka, gin or rum as you wish, or see below for the proportions for a rhubarb shrub martini. Mix rhubarb and sugar in large glass measuring cup or jar. Cover and refrigerate for 2 to 3 days, stirring at least once a day to help dissolve the sugar. Stir in vinegar. Cover and refrigerate for 2 to 3 days. Strain through fine-meshed sieve, pressing fruit to extract all of the juices. Pour into clean jar. Seal and store refrigerated. Add shrub, vermouth, gin and ice to a cocktail shaker, shake and then strain into glass. Alternatively, add shrub, vermouth, gin and ice to a glass. (Double the strength of the shrub for an intense flavour.) Stir to combine. Finish with soda if desired, and garnish with rhubarb stick.